The ferocious fires of Ireland’s culture wars: Chris McCormack reviews Emily Gillmor Murphy’s dark new three-hander at Dublin’s Theatre Upstairs. Monster? at the Theatre Upstairs, Dublin. Photo: Bryan Meade. Is there something insidious about the stories we tell ourselves? In Emily Gillmor Murphy’s combative new play, fairy-tale assurances that women transform from commoners into royalty, wives into mothers, seem downright dubious. It’s as if somewhere along the way, the happily-ever-after warped into the norm. Director Karl Shiels’s production begins as a highly charged dumb show. 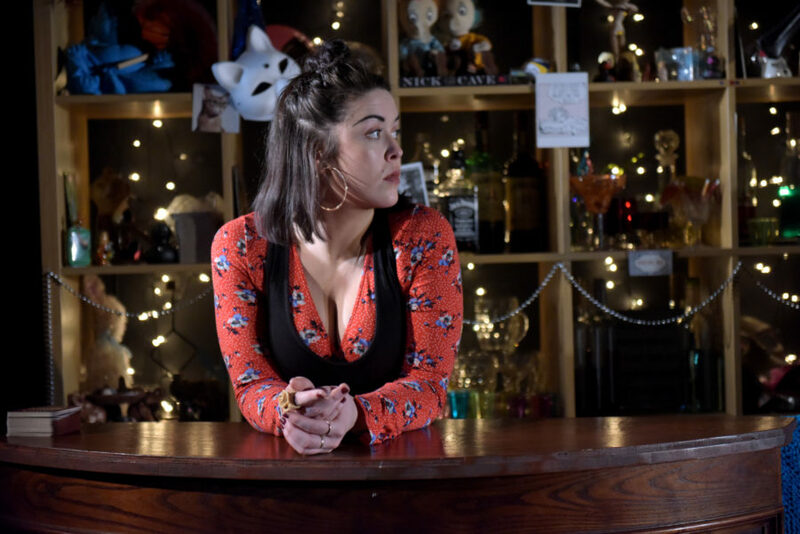 Late at night, bar-owner Nell (Aisling O’Mara) stumbles into her workplace with Adam (Jamie O’Neill), probably inebriated, hands all over each other. The condom is never unwrapped. With horror, Nell narrates: “I don’t want to be a mother. That makes me a monster.” In a state with less restrictive abortion laws than Ireland’s, she might make a less damning judgement. Murphy’s play fascinatingly blends realism with more idealised genres. Adam returns, fashioning himself as a white knight, looking to extend their one-night-stand into the beginning of a romantic relationship. Ushered by a soundtrack like something out of a rom-com, both characters are mildly feverish figures from a manic pixie dream. Nell has a vintage print and a gumshoe impression. Adam is goofily guileless and gives fake flowers. This has all the makings of a biting critique. But Murphy’s play isn’t flexible to match. One moment Nell’s jester-like employee Ru (Michael Glenn Murphy), for instance, will be one-dimensional, his sole purpose to vibrate with cocaine, and the next we’re to take him as something deeper, a grown man with Peter Pan syndrome. This drama is too fragmented to make the leap. That doesn’t stop O’Mara performing with heart, searching for complicated emotion even when it isn’t there. For a work with such a direct stance on a cultural debate, it oddly chooses to be indirect, fleshing out its characters through fairy-tale asides that only vaguely fill us in on their lives. The cast do their best to fill in the blanks. But when tensions escalate after Nell worryingly disappears, it’s hard to believe what’s happening. Why does Adam walk out in the middle of an argument? Can we take Ru seriously as a major player? These decisions are wilder than the strangest fiction. Murphy’s work is obsessed with moralistic storytelling and women’s self-loathing, restlessly so, as if the mechanics of plot and character were an oversight. More a statement, less a play, it undeniably comes from the ferocious fires of Ireland’s culture wars. Monster? is at the Theatre Upstairs, Dublin, until April 29th. For more details, click here.